For many, the job of a pilot has lost its luster. The national security of the U.S. relies on a healthy airline industry. That requires modern reliable airplanes – and highly skilled pilots to operate them. However, the U.S. has a shortage of pilots right now, particularly at the regional airline levels. According to the Federal Aviation Administration, there were about 827,000 pilots in the U.S. in 1987. Over the last three decades, that number has decreased by 30 percent. In the 1970s, when most of today’s airline pilots like myself were growing up, piloting for an airline was considered a prestigious career. The job offered not only high salaries and nice schedules with many days off, but also a respected position in society. In the early 1990s, pilot salaries approached US$300,000 in today’s dollars for some international pilots. What’s more, during this time, the military had a steady and consistent demand for pilots. A young aspiring aviator could go into the military to receive all of his or her flight training. Once these pilots had fulfilled their military commitment, they were almost guaranteed a good job flying for a major airline. Then, the 9/11 attacks left the airlines in poor financial condition. Five of the six major legacy airlines in the U.S. declared bankruptcy: US Airways, Delta, Northwest, United and American Airlines. I clearly recall a day a couple weeks after 9/11, when one of my flights, from Washington D.C. to Orlando, Florida, boarded just one passenger. In the 80s, roughly two-thirds of airline pilots were ex-military. Recently, that percentage has dropped to less than one-third. The Navy predicts a 10 percent pilot shortage in 2020, while the Air Force predicts its own 1,000-pilot shortage by 2022. In 2009, Congress changed the mandatory retirement age for airline pilots from 60 to 65. In my view, this didn’t solve the problem, but merely kicked the can down the road. 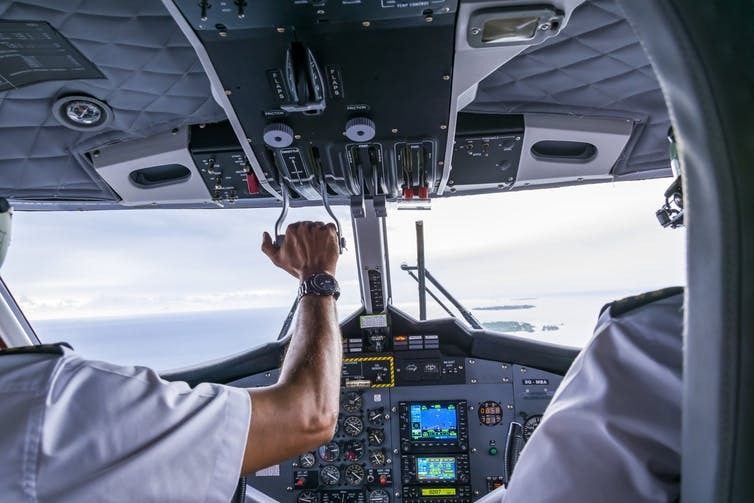 A 2016 report by Boeing shows that 42 percent of the pilots currently flying for the major airlines in the U.S. will reach their mandatory retirement age of 65 in the next 10 years. Meanwhile, this move crippled the career advancements of the more junior, younger pilots. That’s caused many of them – including myself – to seek a more stable career. If that’s not enough, there have been significant changes in the work and rest rules for airline pilots. After the Colgan crash near Buffalo in 2009, Congress changed the pilot experience requirements for the airlines. Newly hired pilots must now have a certificate which requires a minimum of 1,500 hours of flight time. Prior to this law being passed, pilots could fly for an airline with a minimum of 250 flight hours. The industry has taken a few steps to address this problem. Regional airlines now offer much higher pay and even signing bonuses. Also, there have been some minor amendments to the 1,500-hour rule. Pilots can now receive their certificate in fewer than 1,500 hours if training takes place at certain flight schools. There’s even talk of extending the retirement age again to 67.